BARNESVILLE, Ohio — She is brilliant blue, and the world’s largest Longhorn Cow. Not really a cow, but possibly more cow than anything else. Perhaps a 100% Quasi cow! Motorists traveling Interstate 70 in southeastern Ohio at mile marker #200 will notice a huge, brilliant blue, Texas Longhorn cow-shaped billboard to the south of the Interstate. Although the billboard sign designed to appear like a Texas Longhorn looks fairly large, it is actually much larger than many motorists guess it to be. The total height is 28 feet with 64 feet from tail tip to horn tip. The serpentine horns measure 22 feet from one tip to the other. The Quasi Texas Longhorn was constructed on a hill in the center of a Texas Longhorn breeding pasture owned by Dickinson Cattle Company of Barnesville, Ohio. The cattle company moved it’s cattle operation to Belmont County, but is not yet well known in the area for their Texas Longhorn genetics. The huge Longhorn sign was designed to create public awareness of this unique cattle breed now available in the northeast. Texas Longhorn cattle in the pasture seem to be very pleased with the large sign. They like to hang out on top of rolling hills to get the most from the summer breeze. They also like to hang out under shade trees near by. The shade of the sign on top of the hill makes an ideal meeting place for the herd. As travelers cruise down I-70, the tiny image of real Longhorn cattle standing in its’ shade make the sign look its’ true size. Ranch owners, Joel and Chad Dickinson, developed the huge Longhorn silhouette but not without some major problems. The long horns and tail of the sign created unacceptable stress points when considering some of the high winds that come during winter months. The tail was the biggest problem. The tail hangs over 12 feet long, which requires extra support in order to sustain itself during the high winds. The original idea was to reinforce the back side of the tail with large sheets of steel. The next plan was to attach guywires to hold it in place. Knowing that cattle are mischievous creatures and would probably be scratching on the wires continually, that idea did not fly. Finally, with a touch of realism, the support idea was abandoned in favor of a two foot wide hinge which allows the tail to swing back and forth when the wind blows, very much like a cow swatting flies. Interstate 70 helps connect San Francisco and Washington D.C. It’s constructed over much of State Highway 40 which is the famous old National Road. The National Road was one of the heavily traveled wagon roads used by settlers moving west to make their fortune. It is estimated that over 100,000 passengers travel I-70 through Belmont County every 24 hours. Dickinson Cattle Company, LLC, is located north of Barnesville, Ohio, on the south side of Interstate 70. DCC is one of the largest Texas Longhorn cattle breeding ranches in the United States, capitalizing on consumer trends toward leaner beef. DCC produces Texas Longhorn breeding stock, herd sires, Texas Longhorn Decor Products and freezer beef. The ranch headquarters is located two miles east of the large blue billboard, one mile south and one mile west on Muskrat Road #712. DCC provides hardy Texas Longhorn genetics for cattle producers all over the United States and some foreign countries. 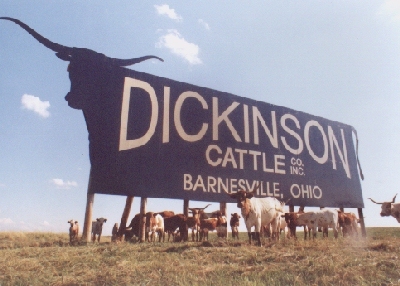 Joel Dickinson, resident manager of DCC says, “Now I-70 travelers will know where Barnesville, Ohio and reputation Texas Longhorn cattle are located”. Barnesville is rapidly becoming known as the Texas Longhorn center east of the Mississippi.